We hope everyone had a fabulous weekend!! We've got a surprise to cure the Monday blues...20% off our entire site for the next 24 hours!!! 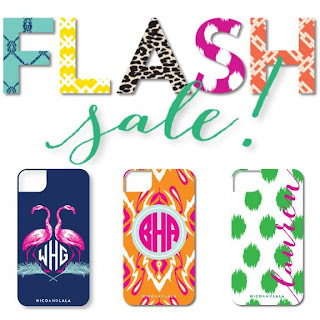 And yes, this includes our brand new designs and iPhone covers!! Be sure to enter code FLASH20 at checkout. Tick tock, our sale ends at noon tomorrow...so get shopping! Wondering what "new designs" we're talking about?! Last week, our website got a makeover!! Introducing our brand new N&L designs!! Our new prints come in a wide variety of colors and designs, and are available on stationery, lucite items, iPad cases, and now....iPhone covers!!! Yes, you heard us right...we've added phone cases to our swanky family! We are so excited at the feedback we've already received about our new designs, and now want to hear what YOU think!! So get shopping, use code FLASH20 at checkout, and let us know what you order!!! custom iPhone case cover, monogram iPhone case cover, custom monogram iPhone case cover, preppy iPhone case cover, preppy monogrammed iPhone case cover, Nico and Lala iPhone case cover. 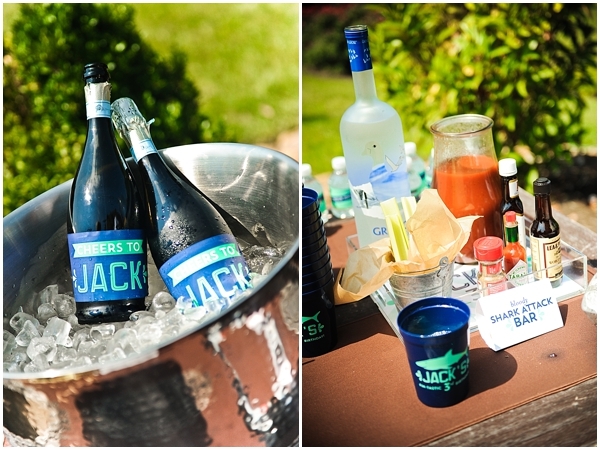 So last week, we took part in celebrating the phenomenon known as "Shark Week." Know what we're talking about?! If you don't, here is everything you need to know: Shark Week is a week-long Discovery Channel event, where the entire week's programming is dedicated to bringing awareness and raising respect for...sharks! From documentaries on monster sharks to broadcasts featuring endangered shark species, there is something for everyone! The week has taken on a life of its own, and has become a social sensation all over the US...including in our studio! That all being said, there is one special reason we were so excited for shark week. 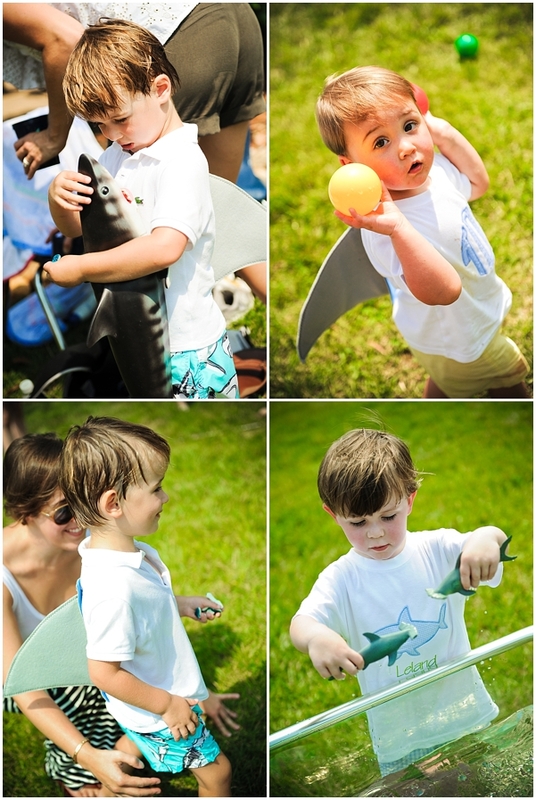 Recently, we got to help design a JAW-some shark themed birthday party (which was appropriately held during shark week) for one of our favorite little customers, Jack!! 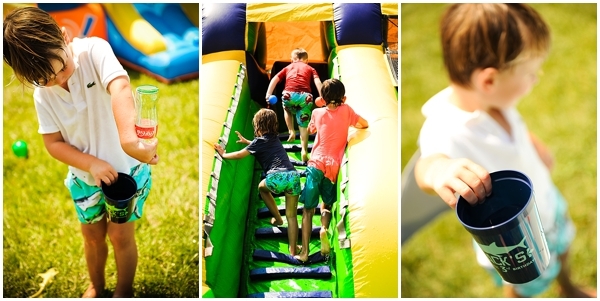 You might remember Union Jack's Olympics themed birthday party from last year (SO fun!!). 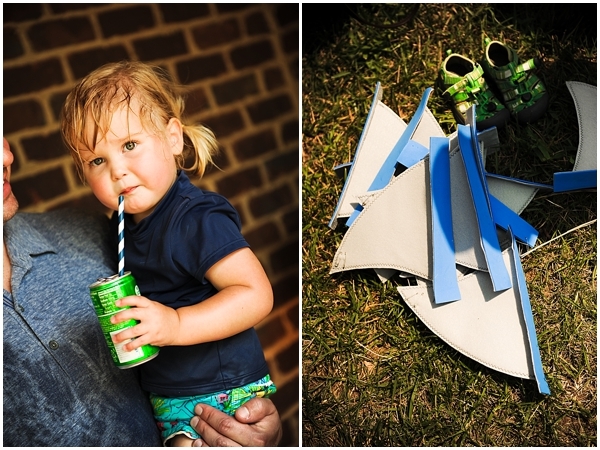 This year, we helped take his party from awesome to JAW-some as he turned three! Open at your own risk...we think we see some sharks in the water at this fin-tastic party! Jack's shark birthday party invitations, aren't they shark-tacular?!?! 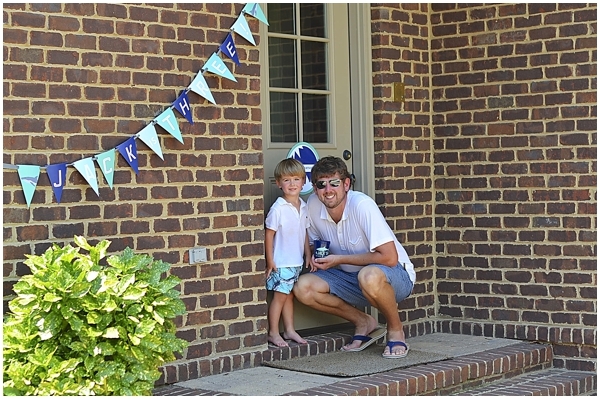 The birthday boy and his dad, posing in front of his birthday signs! 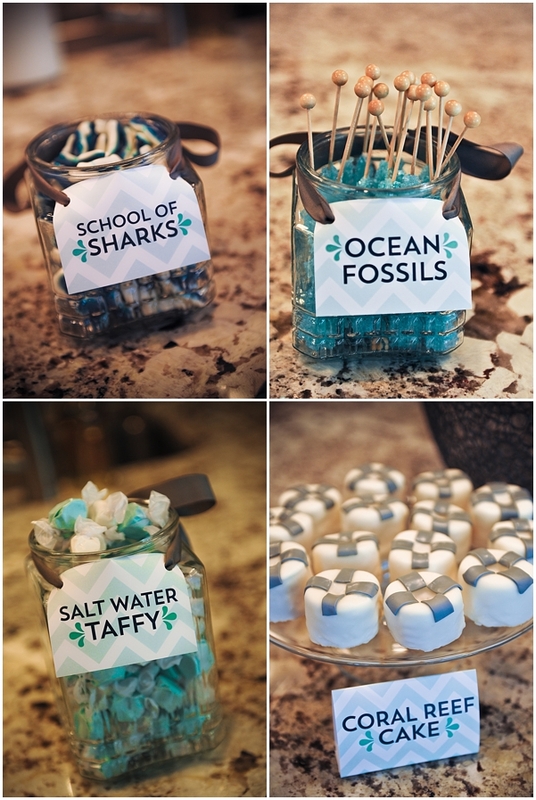 How cute are these shark themed snacks?! SO creative! We'll have one of everything, please! SO cute and creative! 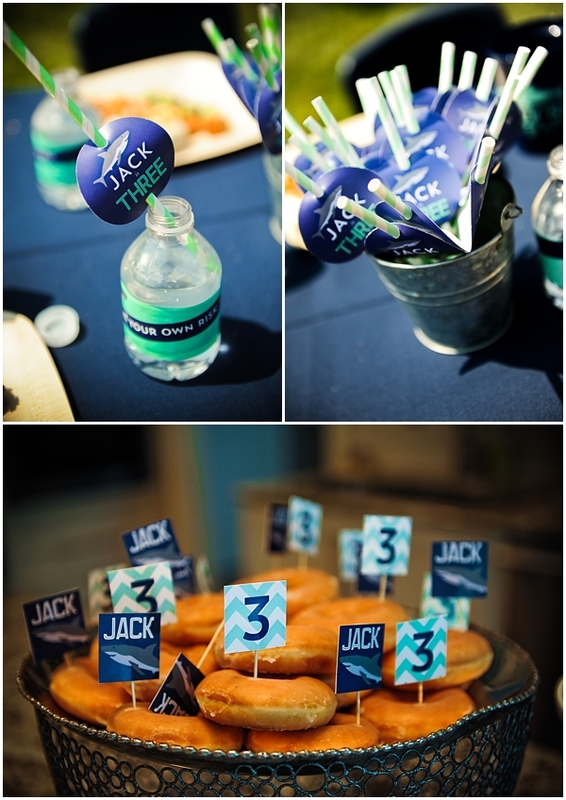 We loved being able to help make another one of Jack's birthdays so special, especially his JAW-some shark birthday party! Check back later in the week for more N&L goodness, and make sure to follow us on Pinterest to discover even more design eye candy! Smith Wedding Part 3: Wedding Day! 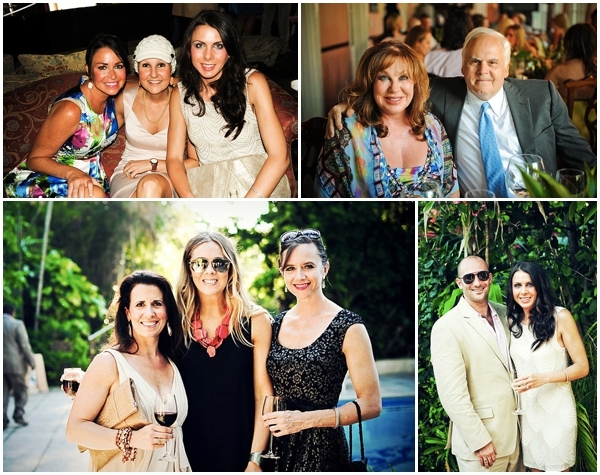 Today is the day: the conclusion of our three part feature on the Smith wedding! Which means today is...wedding day! Before we dive into the finale, just want to give you a quick N&L update. Have you been on our website lately?! Not only did our blog get a makeover, but our online store is getting swankier by the day! We've started adding some of our new notecard designs...starting with some sassy leopard notecards. They are so fabulous, we couldn't resist putting them up! Be sure to check back next week, as we add more new styles daily! Now on to the main event...Kathleen and Matt's wedding day! 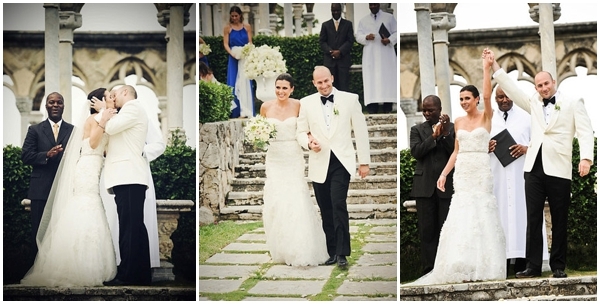 The couple tied the knot at the super swanky One&Only Ocean Club in Nassau--it was out of this world amazing! 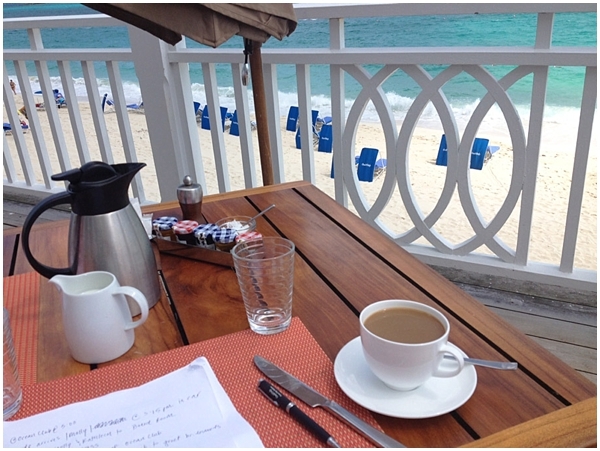 We started off wedding day with a breakfast meeting at the Dune restaurant--delicious! And the view was to die for!! 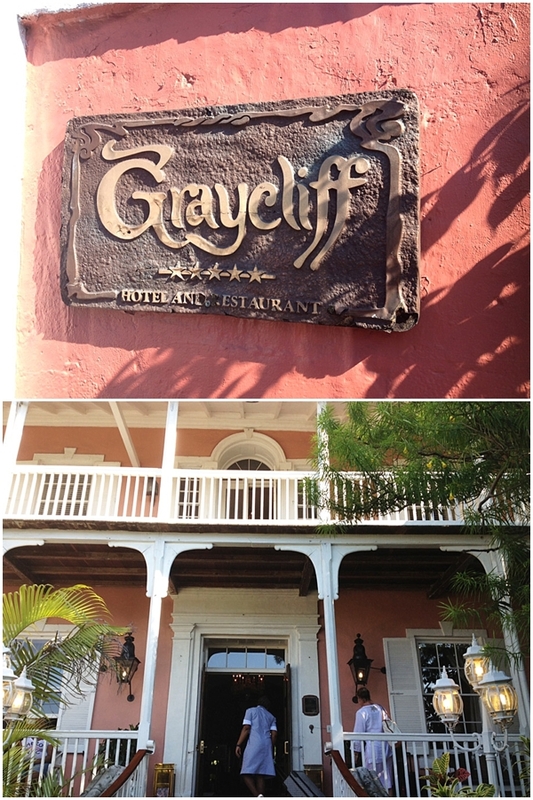 We headed over for a site visit for the ceremony location...we were blown away! 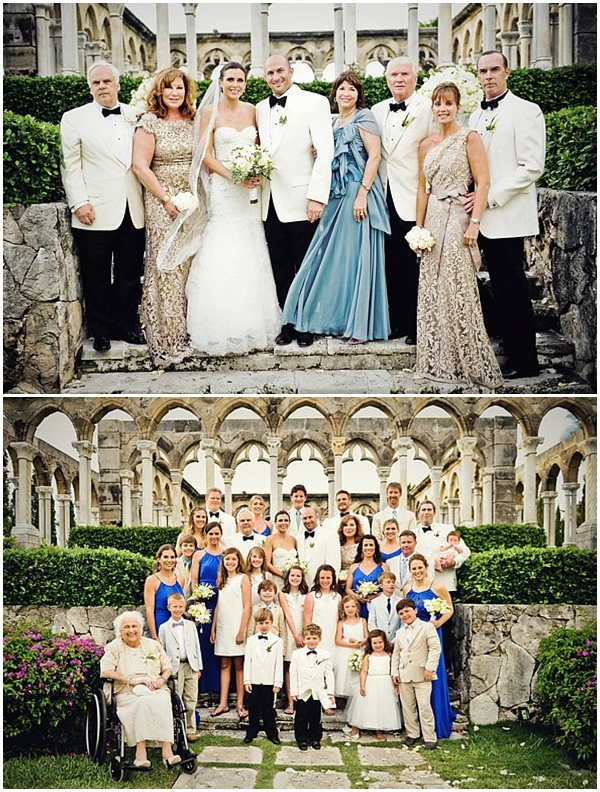 The backdrop for the ceremony included dramatic 12th-century arches with spectacular views of Nassau Harbor. 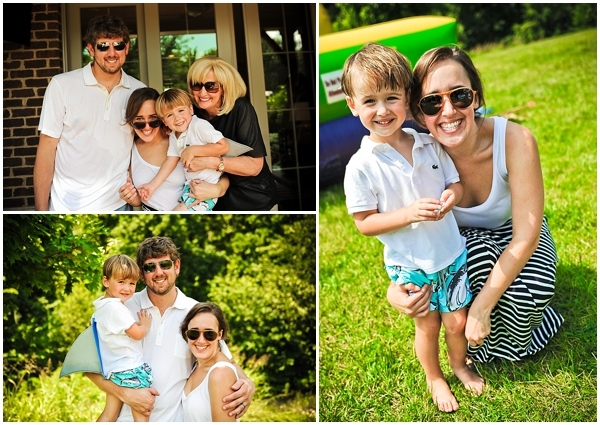 As we got to work helping Dori and her team, the real fun began! 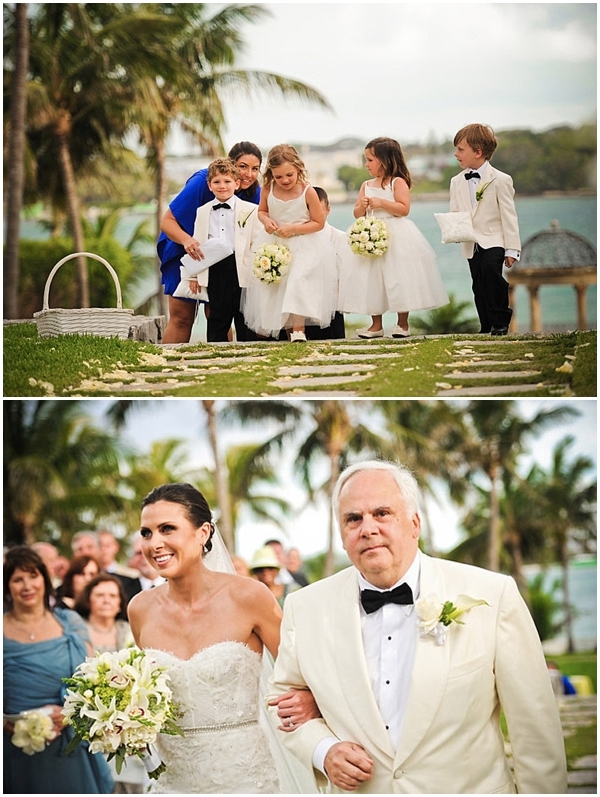 Their big day was an intimate gathering of the couple's closest family and friends, who traveled from all over the country to be part of Kathleen and Matt's wedding. Although it started to sprinkle as the pre-ceremony cocktail hour kicked off, the rain proved to be good luck, as the rest of the day went off without a hitch! 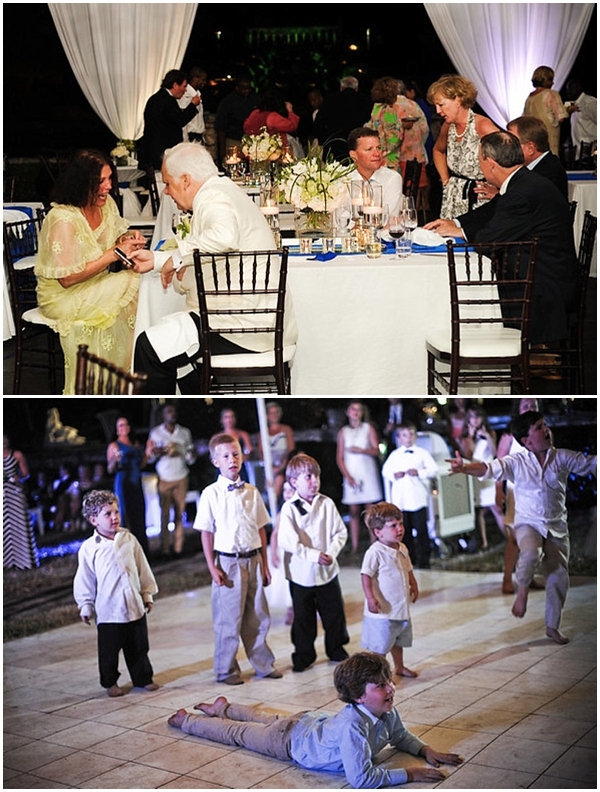 After the picturesque ceremony guests walked to the reception tent, which offered a relaxed and fun party! 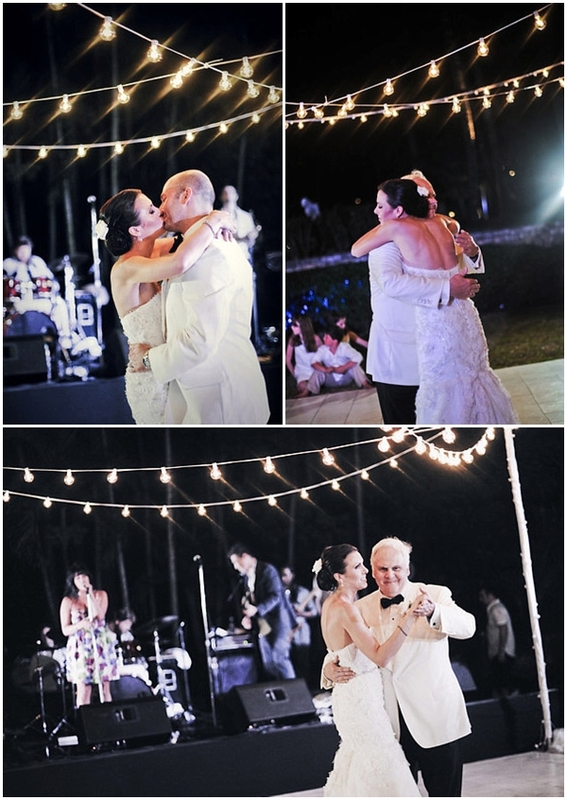 The celebration went into the wee hours of the night, and was full of merriment and love for Kathleen and Matt. Wedding day N&L breakfast meeting overlooking the ocean at Dune restaurant at the One&Only!! View from our breakfast at Dune...heaven!! Ceremony site visit, how gorgeous is this view?! On location for pre-ceremony cocktail hour. Here we are--ready for wedding day festivities! 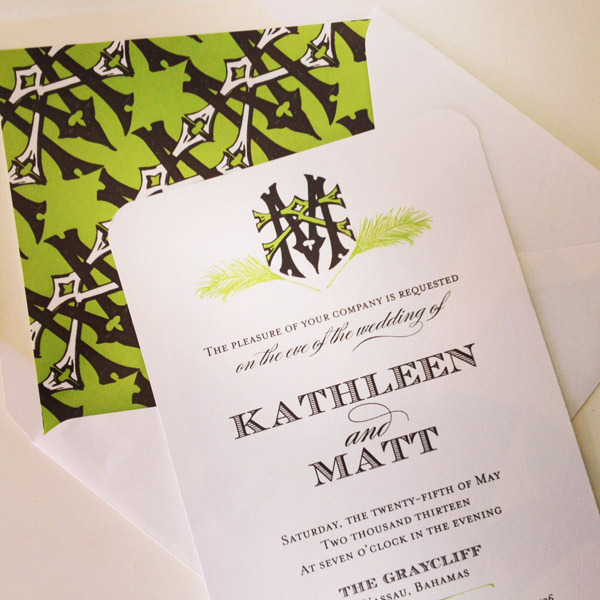 Love the bright pop of color on these beautiful programs! 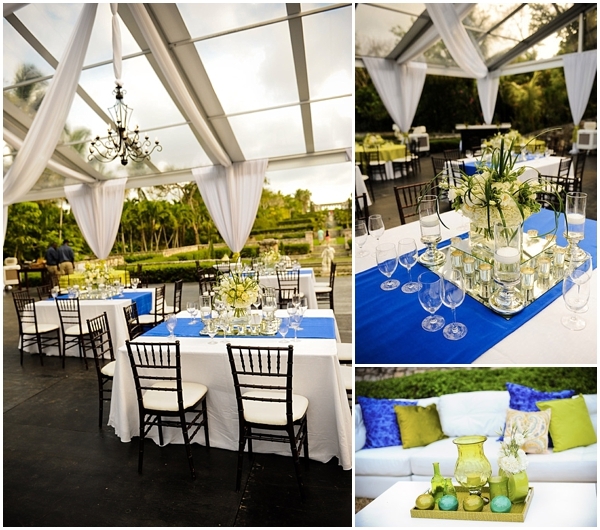 On-site ceremony champagne bar. 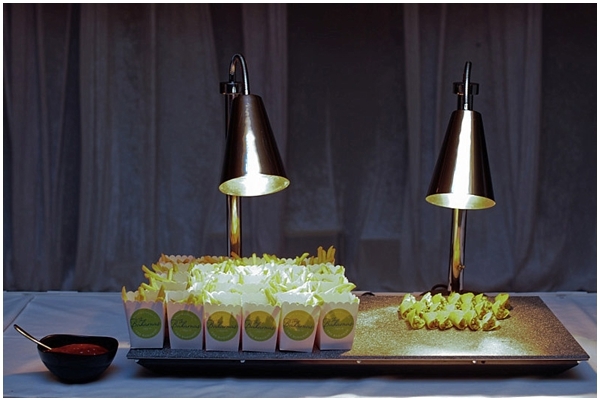 We are obsessed with the lucite bar!! A hand-rolled cigar station was also on site for the ceremony. 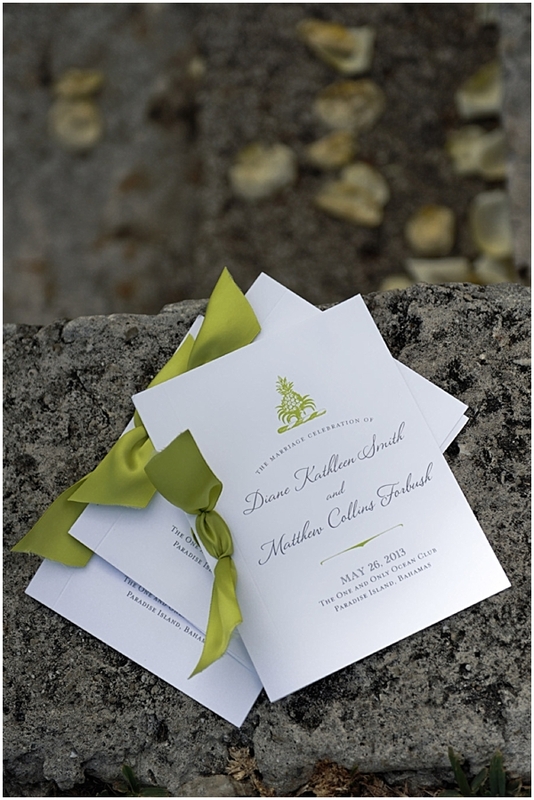 Again--a big thank you to Kathleen and Matt for including us in their special day, and to photographer AK Vogel for letting us use her beautiful photographs! 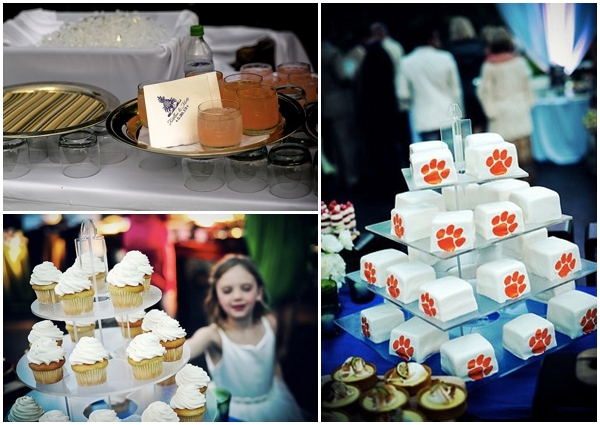 We had so much fun being a part of this wedding!!! Ps. 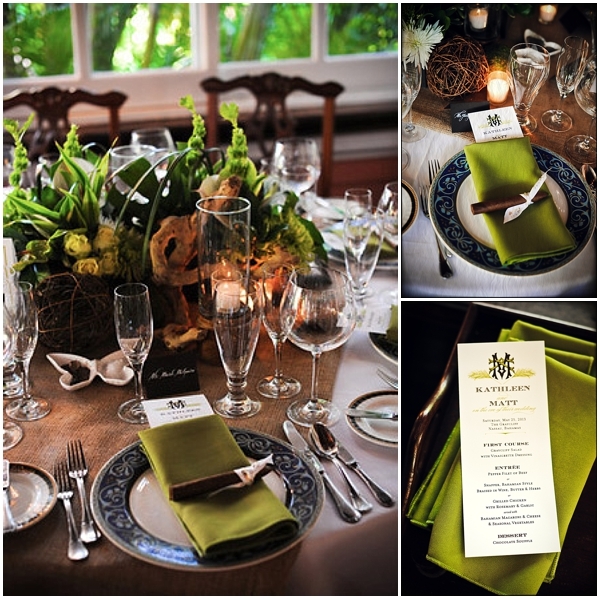 For more of Kathleen and Matt's big day, be sure to check out their real wedding feature on our website. We can't believe August is already here...where has our summer gone?! We hope y'all are loving our new blog design as much as we are--what do you think?!! 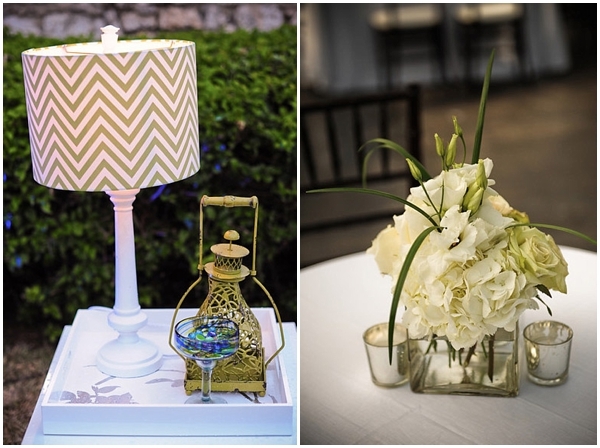 Today we are excited to share part two of our feature on The Smith wedding! 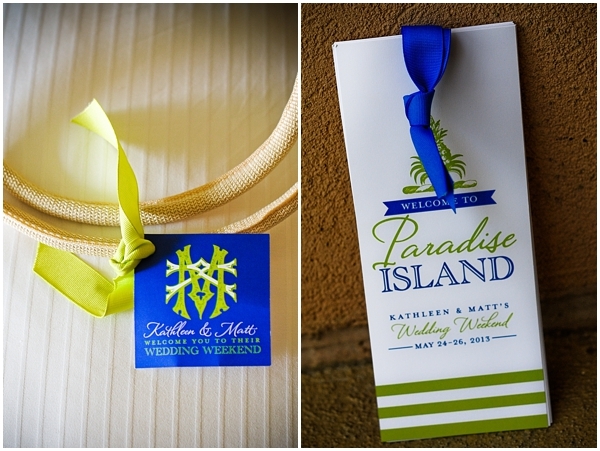 When guests travel from all over the country to the Bahamas for your wedding, what better way to say "thank you" than with a fun welcome bag?! 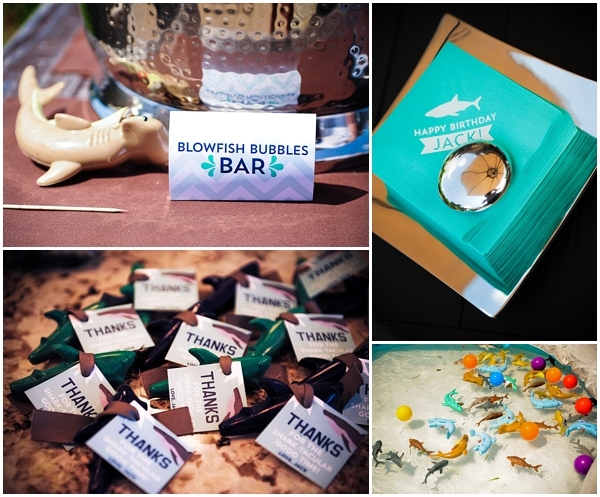 Nothing says "welcome to the Bahamas" like a swanky bag filled with goodies! 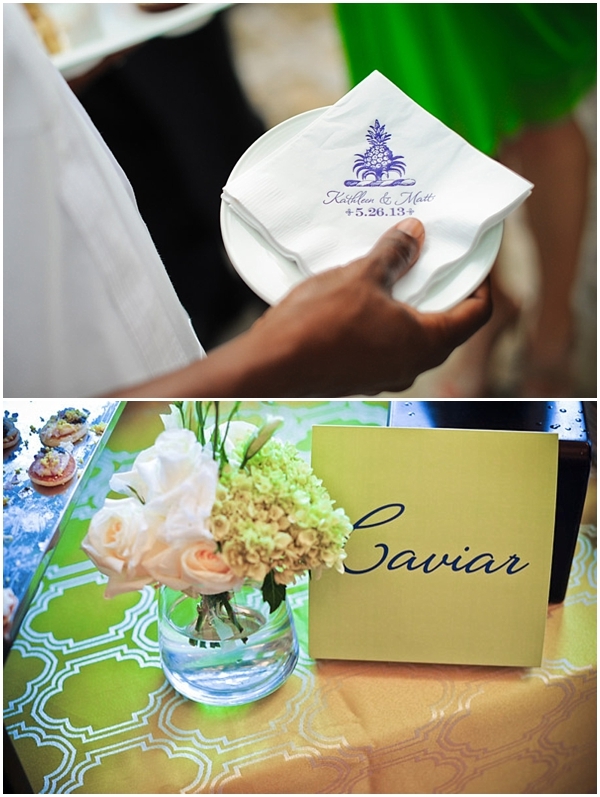 From the beginning, the Smith welcome bags were a labor of love. We had a blast designing the bags and all of the swag inside them! 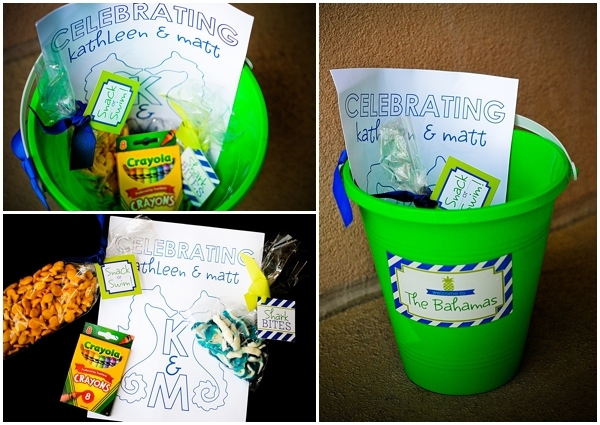 In fact, we actually ended up putting together two different welcome bags: one for adults, and other fun bags for the kids--such a fun idea! After gathering all the pieces for the bags in Chicago, we shipped them down to the Bahamas (and have to admit, we had a couple sleepless nights worrying that one box would get lost/ not make it there in time). 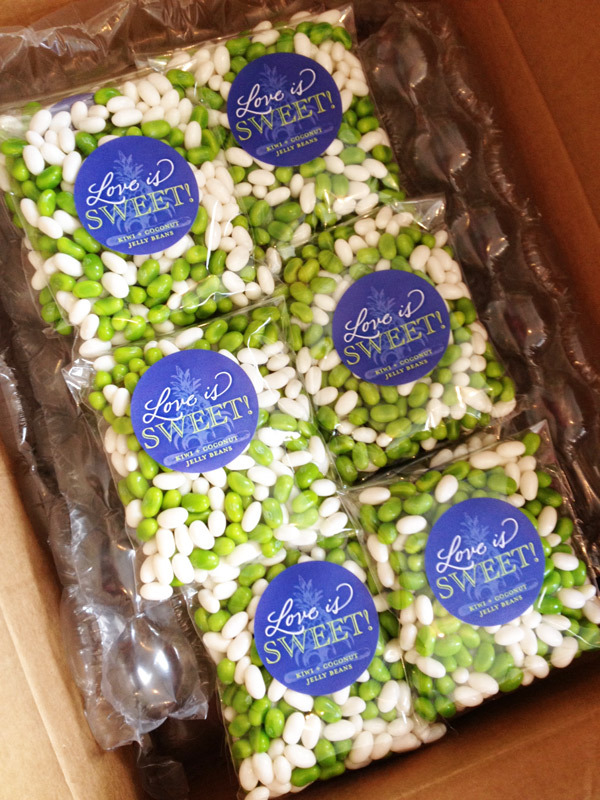 Luckily, all boxes arrived safely--then the real fun began! We set up welcome bag central in a hotel conference room and went to work! Two days later, we were done!! See the final result below. 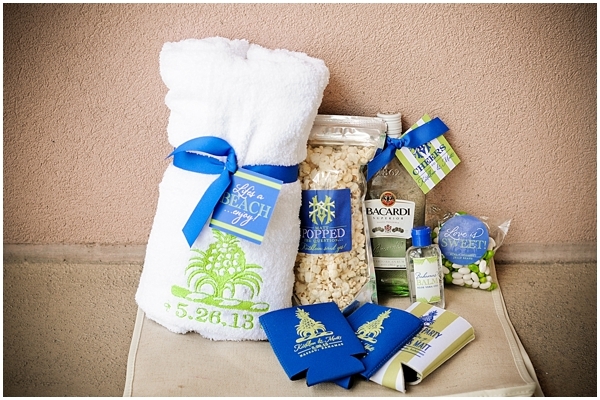 To ensure all guests were able to cheers the happy couple, we included a bottle of rum and custom koozies! 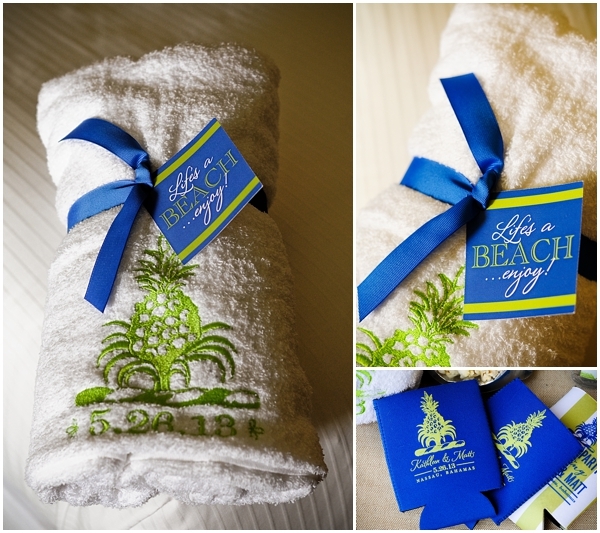 For those wishing to indulge in the sun and sand, mini aloe bottles and embroidered beach towels (which turned out amazing) were provided. 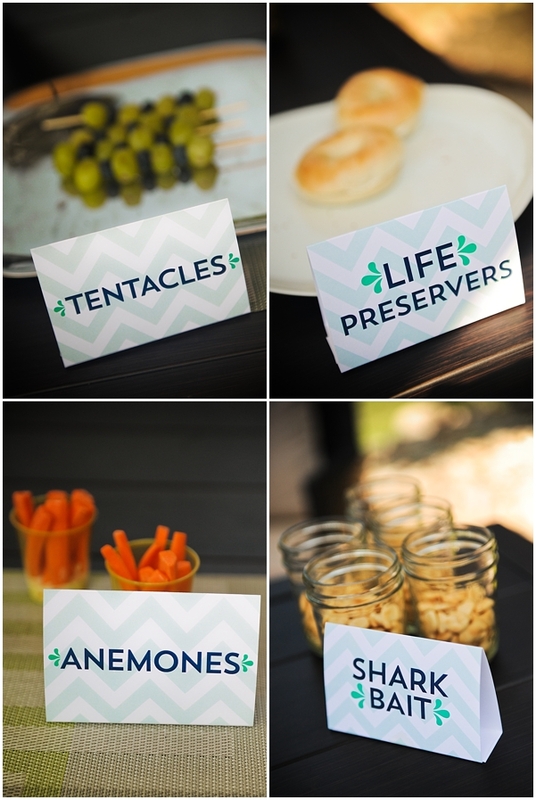 To ensure guests were fueled the entire trip, we included snacks like popcorn, nuts, and coordinating kiwi and coconut jellybeans...because love is sweet! 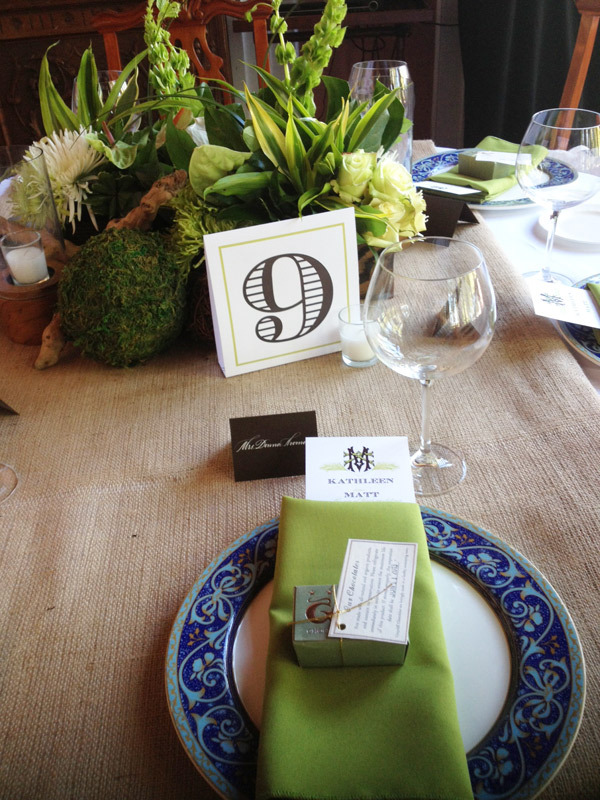 In addition to creating welcome baskets, we also helped add swank to the rehearsal dinner!! 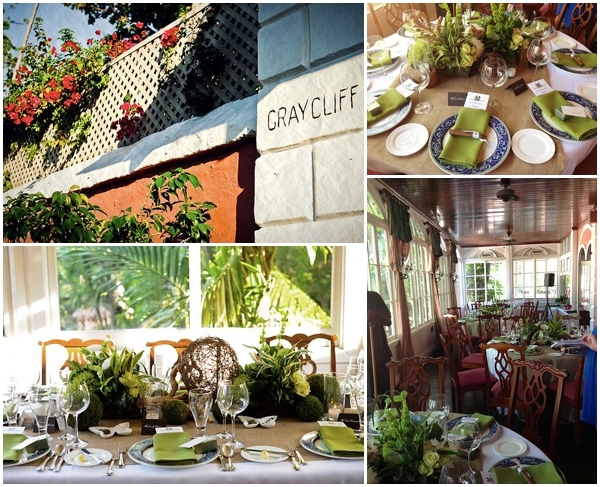 Held at the historical (and world-renowned) Graycliff Hotel and Restaurant, the dinner turned out beautifully! 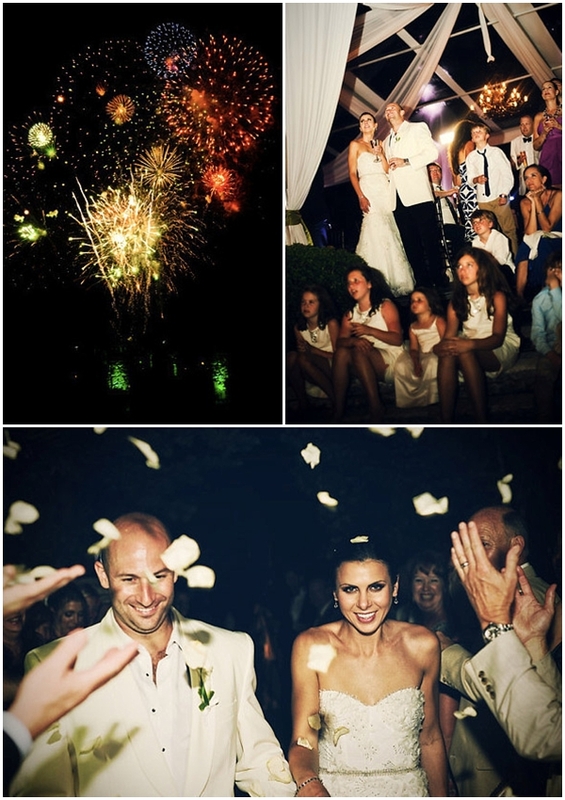 Stay tuned for our final post featuring the wedding day! In the meantime make sure to catch up on part one of the Smith wedding, and make sure you're following us on Twitter for sneak peeks from our final post! Ps. 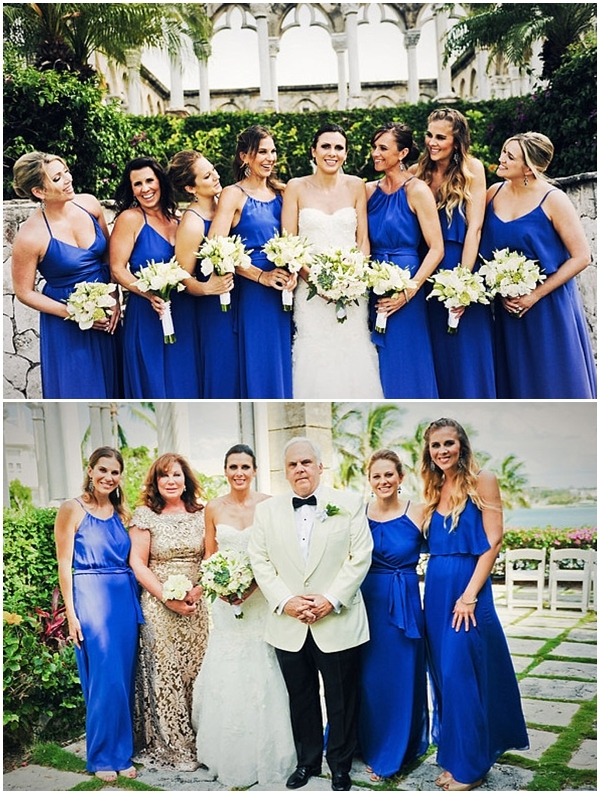 For more of Kathleen and Matt's big day, be sure to check out their real wedding feature on our website!